To see what the Nvidia GeForce GTX 1070 Founders Edition is truly made of, we compared it against several different cards. The $328 EVGA GTX 970 FTW was a no-brainer, along with the $325 Sapphire Nitro R9 390, as those are the GTX 1070’s direct previous-generation peers. 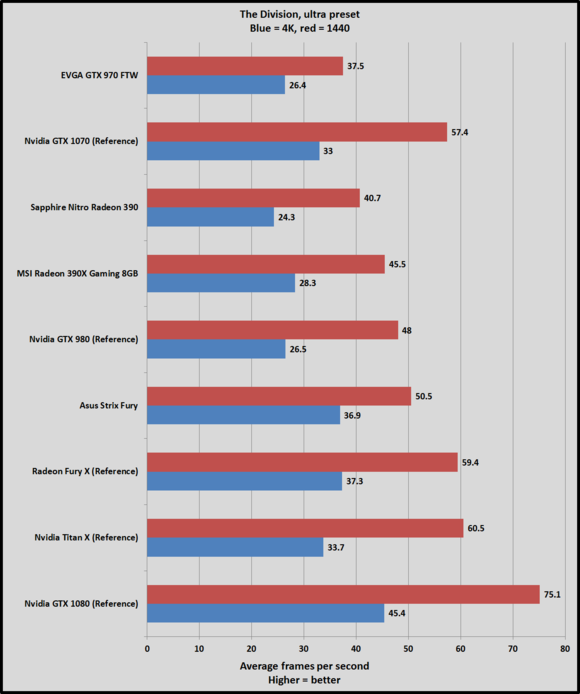 Since Pascal’s 16nm FinFET leap represents a big performance boost, we also benchmarked the reference GTX 980, the $460 MSI Radeon 390X Gaming 8GB, and the $650 Radeon Fury X, as well as the $1,000 Titan X—the latter being a performance rival that Nvidia specifically called out during the GTX 1070’s reveal. 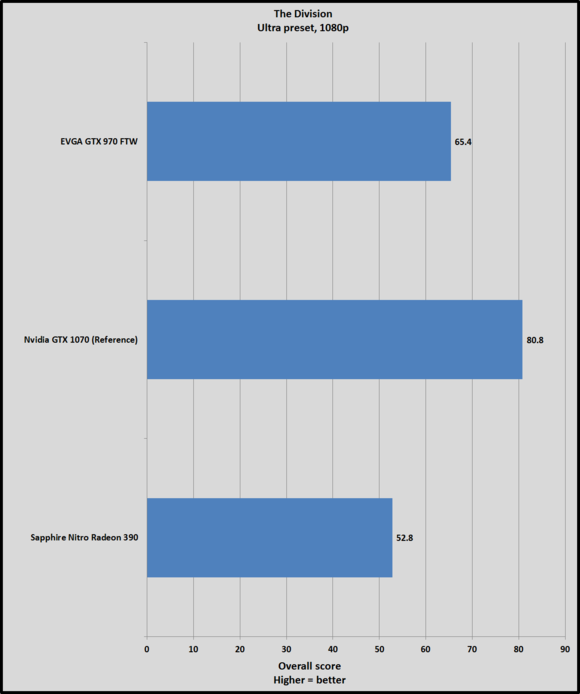 Because the GTX 980 Ti’s performance closely mirrors the Titan X’s, we didn’t test that card. Sadly, time constraints—this card is launching during Computex, one of the biggest PC industry trade shows of the year—prevented us from testing the GTX 1070 Founders Edition’s overclocking capabilities. First up: Tom Clancy’s The Division, Ubisoft’s third-person shooter/RPG that mixes elements of Destiny and Gears of War. The game’s set in a gorgeous and gritty recreation of post-apocalyptic New York, running on Ubisoft’s new Snowdrop engine. Despite incorporating Nvidia Gameworks features—which we disabled during benchmarking to level the playing field—the game scales well across all hardware and isn’t part of Nvidia’s “The Way It’s Meant to be Played” lineup. AMD hardware’s slight lead at 4K resolution with everything cranked might be part of the reason why. Here, Nvidia’s claims hold true. The $380 GTX 1070 indeed goes toe-to-toe with the $1,000 Titan X—though the leap in performance from the GTX 970 to the GTX 1070 isn’t as momentous as the performance leap from the GTX 980 to the GTX 1080. Where the GTX 1080 delivered frame rates roughly 70 percent higher than its direct predecessor, the GTX 1070 only offers a 23.5 percent bump at 1080p, a 53 percent bump at 1440p, and a 25 percent bump at 4K.